Many of us who are lucky enough to live in downtown Princeton recognize the benefits of living in a close-knit community where we frequently see our neighbors and interact spontaneously with friends while shopping or walking around. 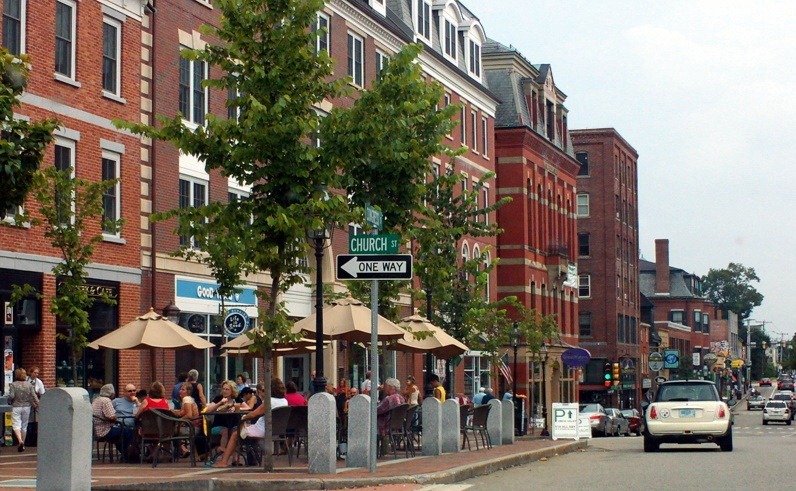 A University of New Hampshire Study, funded in part by the EPA, went further and actually looked to see to what extent walkability correlated with measures of social wellbeing among 700 residents of Portsmouth NH (pictured below) and Manchester NH. These findings fit with something that many of us intuitively see as true: there is a great sense of neighborhood when people are able to walk around to carry out their daily business. It brings people into the public space together and allows random encounters and conversations. Many people in car-dependent neighborhoods have a good sense of community too, but it’s hard to have the same interaction when you’re zooming along in a car. This entry was posted in Walking, Zoning. Bookmark the permalink.